Make a great first impression - with your website! As you well know, first impressions count and it takes just one-tenth of a second for us to judge someone or something and form an opinion! Many people are under the illusion that a hotel’s first impressions are made at the point of reception, stood outside the hotel on arrival or even on meeting front of house staff at check in …but in reality, guests have more than likely already formed their opinions far before this point. In a day and age where digital rules, guests are flocking online to check out the hotel’s offerings and to decide whether or not the hotel meets their expectations. When it only takes a few milliseconds for bookers to form an opinion on your website, it is of course of no surprise that a property’s website is of upmost importance in moulding a potential guest’s first impression. Your website is the digital version of old school brochures, an opportunity to really showcase your facilities and show off your best assets. Photos of the bedrooms (and the views, if picturesque) are highly sort after, with potential guests wanting to see what they are paying for. If your property offers conference and banqueting facilitates and hosts weddings and events, make this known on your website and again, display lots of photos. First impressions cannot be changed, you want a potential booker’s perception of your hotel to be positive and welcoming in the first instance. A study carried out by British researchers found that 94% of first impressions are design related when it comes to websites, making visual appeal top of the list. 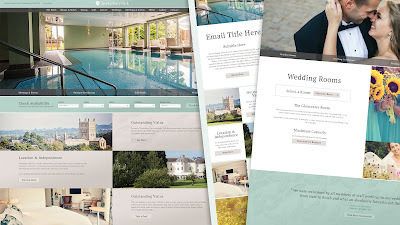 Give your property the best chance of securing the booking and invest in your best piece of marketing – your website! How do I make a printable fax cover sheet? Do you include fax cover sheet in number of pages? how to get best digital paino n affordable prices. I used to think that there is only HTML and CSS that work towards providing an amazing website. Later, I got to know that a lot of other web-services (won't mention names) also really help in providing free web creation and stuff. Thanks for sharing this article mate, really appreciate it! I have a similar blog for you guys, check it out today!